4x1 Custom Imprinted Pencil Shaped School Magnets 25 Mil is a good promotional item for elementary schools, kindergartens and school supplies brands. The unique pencil shape allows your brand to convey their business message pretty easily. When you have these kinds of custom printed magnets in your hands, why should you struggle to explain your brand products and services to people anymore? Order these custom school magnets today to get our free full-color printing and free shipping offers! 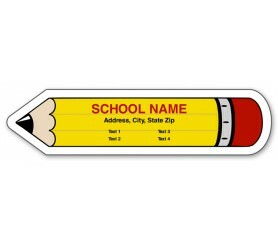 Request a quote to know price cuts that you can avail for wholesale 4x1 Custom Imprinted Pencil Shaped School Magnets 25 Mil.